In this photo, I’ve already used my center-start method to braid the left ‘half’ (really about a third) of the braid – I started braiding from the point where the blue clip is now attached, and braided outward to the ends of the loops on one end of the braid. Then I looped that finished section snugly around the C-clamp, in preparation for braiding to the opposite end of the loop-bundle. So one whole section of this too-long braid got braided without having to do any loop-shortening! Starting from the center of a loop bundle allows you to make a braid exactly twice as long as your normal length limit, with almost no extra set-up time. [Details in my Longer Loop Braids post.] However, since this braid is planned be more than twice my normal length limit, I will be using caterpillar tie-ups to temporarily shorten the loops of the opposite end. After finishing that first part of the braid, I hung the finished section securely onto my C-clamp, with the as-yet-unbraided (and much longer) ‘half’ hanging down in front. The loops are temporarily organized onto a comb to keep them in the order I want when I start on the second half of the braid. This isn’t actually necessary, though – I made extra-long braids for years before I started mounting the second set of loops onto a comb. Then I shortened the working length of each loop by tying a single slip-knot partway down its length. That blue clip was not yet clipped on then – it would have distorted the loop-lengths as I was tying the slip knots. The loops should all be the same length – these ones look uneven because they are lying loosely on the chair, but they actually are all about equal in length. This braiding thread is very slippery nylon, so the center-start braided area did loosen up while I was tying the slip knots. Not a problem – afterwards I manually pulled it all tight and firm again. After tightening up that “start” area, I then clipped the blue bag-clip onto it to prevent any more loosening, and began to chain up the ‘caterpillars.’ I start from that first slip-knot and work downward, which compresses the extra loop length into a short, stubby length that dangles harmlessly at the bottom of the loop as I braid. 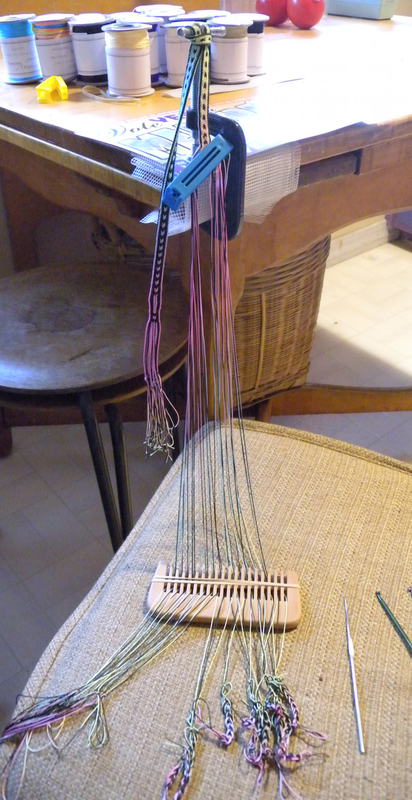 When I’m ready to braid I will remove the blue clip (and move the loops from the comb onto my fingers). 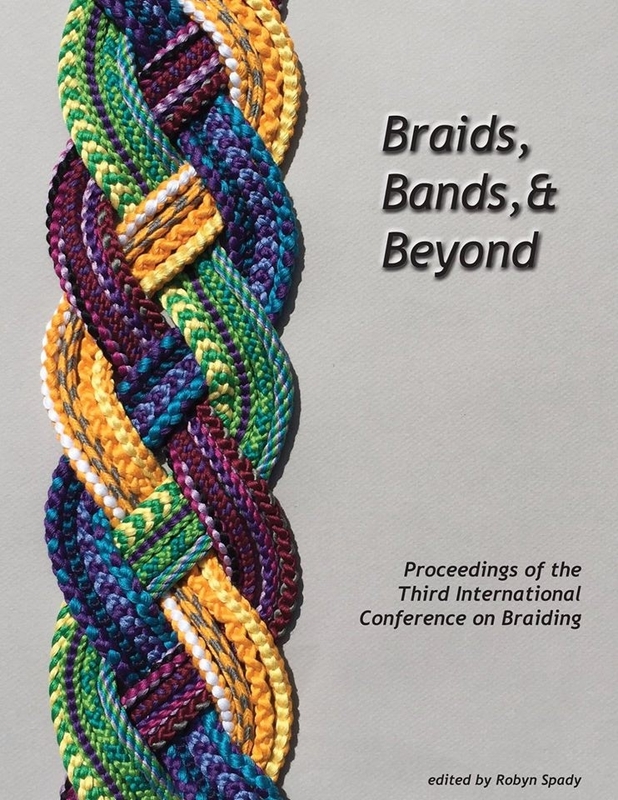 There must be nothing attached to the starting area when I start braiding – no clip, no string, no knot – or the strands there wouldn’t tighten well and my braid would have a loose, gappy section at the center-start area. I usually tie the braid onto the C-clamp using the finished part of the braid itself, as shown in the photo, but with an actual knot rather than a simple wrap. However this braid is holding quite firmly, so I don’t think I’ll need to tie it any further. In this photo, I am halfway done making the caterpillars. Completed caterpillars are to the right side on the chair-top. Loops waiting for their caterpillars are on the left side of the chair-top — a lot of their length doesn’t show because it’s hanging over the edge of the chair. A caterpillar is simply a chain of slip knots formed onto the first slip knot. That’s the same thing as a crochet chain, and I usually use a crochet hook to do it, but it’s just as easy to use your fingers. At the end, pull the last loop all the way through so the chain of slip knots won’t unravel. Later on, when you want to unravel that chained-up length to braid the final section of the braid, you’ll just undo the last knot on the chain and pull the end to make all the slip knots pop out. The comb: I don’t braid with my loops on a comb! Wouldn’t work at all. But a big-tooth comb with a rubber band around it can hold the loops in the correct order while you are fussing with them. I’ve demoed my comb strategy elsewhere on this blog, as a way to put loops down and take breaks while braiding. It’s easy, quick, and useful – first-time braiders I’ve taught learn and use this trick right away. It’s also a great way to keep your loops in order if you want to do something to them – like say you discover you need to re-tie all the knots at the ends of your loops. The loops are free to move around on the comb, you can slide one or more forward, measure them, untie/ retie, whatever. Yet they can’t fall off the comb and get out of order because that rubber band is a complete barrier. When you are ready to braid, you remove the rubber band, and load the loops one by one onto your fingers. With kute, you have to tie a separate caterpillar for each strand, so two caterpillars per loop, because the two strands of a loop are connected separately to each end of a kute (kute are the ‘handle’ strands that are often attached to the ends of the loops in hand-held braiding). At the end of the post, she says that she had some trouble dealing with the strands. I think she means in setting them up, not in braiding with them, because earlier she said that whereas she had expected the caterpillars would be difficult to braid with, in fact they were not. The first few times I did it, I had trouble too setting up caterpillars in a braid of many loops. But after a few times you work out the kinks and everything gets simpler. See full copyright restrictions and permissions at the bottom of the sidebar (if you are on a small screen device, the ‘sidebar’ may appear somewhere other than at the side of the screen). June 8, 2018 in Tips.